Brian K Julyan, FIH, MS, LCG. Brian has worked in all areas of the Hospitality Industry and held numerous additional positions including 14 years as Cellar Master and Event Consultant for The Lord and Lady Clifford of Chudleigh, and 9 years as Catering Manager for The Ministry of Defence Summer Army camps. His consultancy clients have included The Grosvenor House, The Savoy, The Ritz Hotel, Millennium Copthorne Hotels, Hakkasan Restaurant Group in London, Corinthia Hotels Malta, the Constellation group in the US, plus Celebrity, Oceania and Regent Seven Seas Cruise Lines, all based in the US, and Shangri-la Hotels, China. He is an International Judge for Wine, Restaurant Service, National and International Sommelier Competitions, and The Best Wine List of Australia final (2008, 2009, 2010, 2011, 2012, 2013). He has won numerous awards at Gastronomic Festivals including Gold medals in culinary and cocktail competitions. He is, on a voluntary basis, a judge for National and International Sommelier competitions. This includes, over a number of years, the setting and chairing of the panels for The Best Sommelier of China, and the World finals of The Cha?ne des R?tisseurs, Jeunes Sommeliers Competition. Sometime Chief examiner for the C&GLI and the HCIMA Food and Beverage programmes, he was a Government Inspector for Colleges and Universities until his retirement as Head of the Hospitality Management Degree programmes, University of Plymouth, UK. 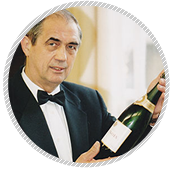 In 1972 he passed the prestigious Master Sommelier Diploma and proposed the formation of the Court of Master Sommeliers, established in 1977. This has developed into a world-wide examining body providing education, training and certification in Beverage Service, Wine knowledge, and wine tasting. Brian has been Chief examiner since1990 and Chief executive since 1998. The American part of the organisation has now established its own Chapter, Brian is now CEO of the Court of Master Sommeliers Europe. Author of three books, his latest, Sales and Service for the Wine Professional, was published in 1999, re-printed in 2001, 2003, 2nd edition April 2003 reprinted 2004, 2004 (twice), 2005 and 2006, 3rd edition 25th April 2008 re-printed several times, a 4th edition along with a Chinese edition will be published early 2014. Brian gives time to encouraging and assisting candidates preparing for the Master Sommelier Diploma examinations by providing tutorials and tastings. He is a Fellow of the Hospitality Institute by examination, a Licentiate and Honorary Member of City and Guilds, and an Honorary Member of The Academy of Food & Wine Service. In addition to the above he has carried out voluntary assignments abroad including preparing a company for privatisation in Estonia and a three month assignment in Tanzania preparing the syllabus and curriculum for the Tanzanian National Hotel School. In 2005 he was awarded the 3rd Annual 'Ho'okele' Award for Lifetime Achievement at the Kapalua Wine and Food Festival Maui Hawaii.